Credit Unions provide a place for you to save and get loans at reasonable rates. Together with the other Members, you own the Credit Union and therefore have voting rights on what is important to you. Credit Unions have a volunteer Board of Directors so all profits go back to the members by increasing products or offering better services and rates. Member Serving Members! Why Sabattus Regional Credit Union? We pride ourselves on providing personalized, superior member service. We are small enough to greet our members by name, but offer the same products and services available at larger institutions. It’s easy to become a member of Sabattus Regional Credit Union! 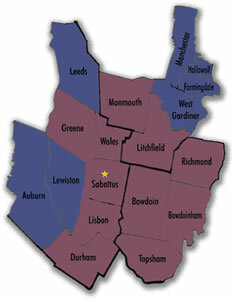 Persons who work, live, worship, own a business or attend school in the towns of Manchester, Hallowell, Farmingdale, West Gardiner, Litchfield, Monmouth, Leeds, Greene, Wales, Sabattus, Lisbon, Durham, Bowdoin, Bowdoinham, Richmond, and Topsham, Maine cities of Auburn and Lewiston, Maine: and also including the employees of the Sabattus Regional Credit Union and the members of the immediate families of, and organizations and associations of, all persons within the above-defined community. Stop by our office located at 2 Middle Road, Sabattus, ME to open your account. Please have your Social Security Number, a photo ID, your $25.00 membership deposit, and proof of your physical address.